The first thing that caught my attention with the New Bright Hi-Rider series (4 different versions are available) was the price. It cost $10.99 at my local Toys R Us store, which is normally the price of the two function RCs that only go forward or turn one direction in reverse. The Hi Riders, though, are full-function, meaning they go forward or reverse, and turn left or right whether going forward or in reverse. 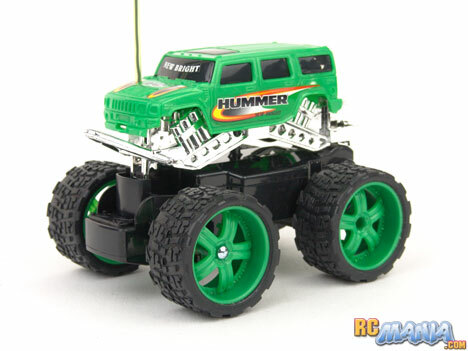 Now, this is pretty small RC truck at less than 6" long with the bumpers, and it's also a bit comic-looking in its proportions, but keep in mind that it's marketed towards kids just four years old & up. That's why the even smaller controller, 3 1/2" wide, is perfect. An RC this small and for kids this young would do well being able to drive around the kitchen, on a hardwood floor, or on a concrete patio. The New Bright Hi-Rider truck handles those just fine, and is actually pretty fast for what it is. It certainly has more speed than what I'd consider to be the minimum acceptable level. For extra credit, I took it on some low-pile carpet, and then some medium carpet. It drove just great on the hard, shorter carpet. It was slower than on a hard floor, but that's to be expected. On medium carpet, surprisingly, it just kept going. The tires are large enough that it can float right over the bumpy surface and not sink down into the fibers and get stuck. It will even handle transitions between different surfaces, like going from a linoleum floor to a carpet, and pops a momentary little wheelie if you hit it at full speed. Next I even took the truck outside and onto some gravel. Again it was slow, but it could still handle it, and I could turn, stop, and reverse at will. The New Bright Hi-Rider truck does everything I can ask of it, and more. It's the perfect full-function RC for a young child, a hundred times better than the typical cheap cars that just go straight and turn in reverse. With full control, kids are given an opportunity to gain more hand-eye coordination, and as their skills improve, they'll be able to get more use out of the truck, rather than immediately outgrowing it. Add to these points the incredibly low price, and New Bright Hi-Riders are true gems in the toy aisle. Make sure you look for the "Hi Riders" name and "full function" on the box!